I’ve been baking a lot of things that needed egg yolks lately, so to use up all the leftover egg whites I’ve been on a macaron baking spree. I’ve been having a play with sizes and flavours and have baked so many macs I don’t even need to look at a recipe any more. This week I decided to have a little fun with the look of the macarons. Macarons strike fear into the heart of many, but they’re not especially difficult if you treat it with care. The first step is to get all the lumps out of your almond meal mixture. 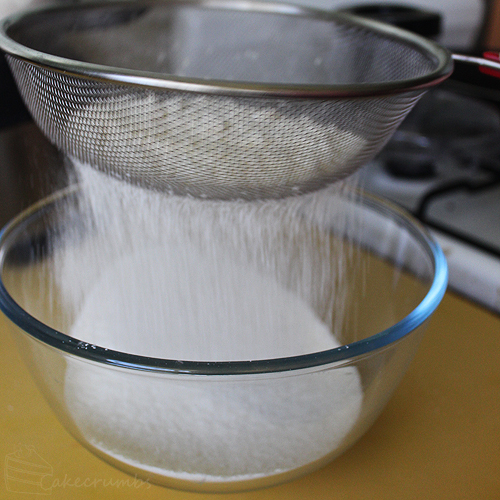 I always begin by processing the almonds and sugar in a food processor, then sieve it thrice. Once through a large-ish sieve, then twice through a finer sieve. This helps keep the surface lovely and smooth. The most important part is getting your meringue right. It’s not especially difficult. The main thing is to use squeaky clean and grease-free bowls and utensils. 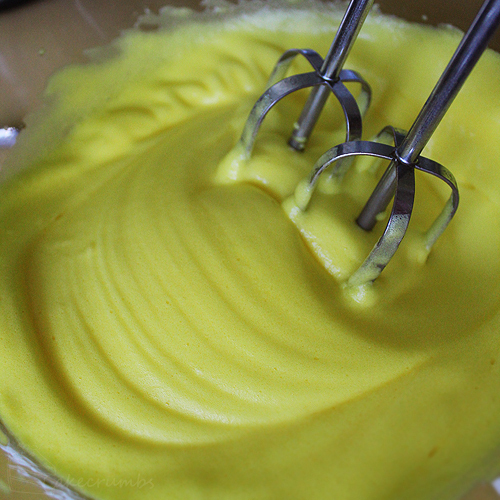 When colouring the batter, you want to start by beating the mixture until it is frothy, then add the colouring. Only use gel paste or powdered food colouring. 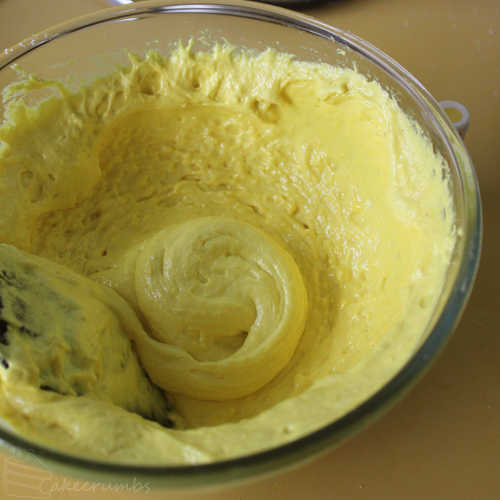 And liquid colouring will make the batter too runny and cause problems down the track. Then it’s a matter of getting it to a perfect stiff peak. 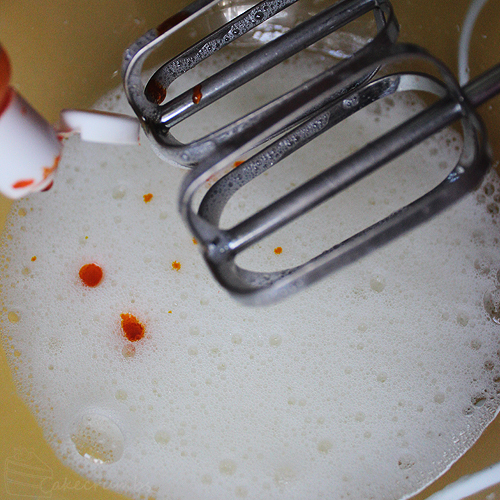 You’ll notice ribbons begin to form in the egg whites, which happens at around soft peak stage. This is a sign you’re not that far away. When this mixture is whipped enough that it will stand up to a peak on its own when the beaters are lifted, you’re ready to go. Now it’s time to add the almond meal to the meringue. Never the other way around. 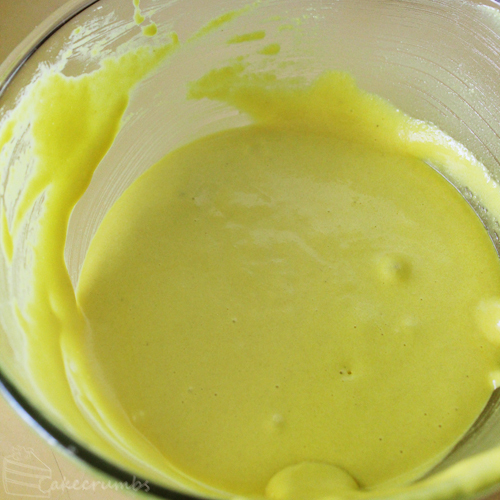 Gradually fold it in until all the mixture is combined. Then begins the process called macronage. 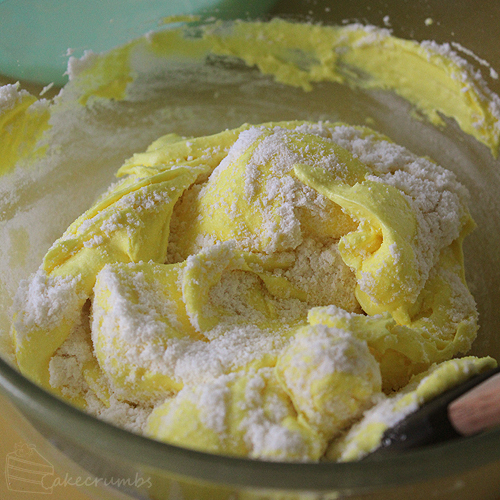 This involves swiping the mixture against the side of the bowl to deflate it. When you first begin you’ll notice the mixture is really airy and will adhere to the sides of the bowl. 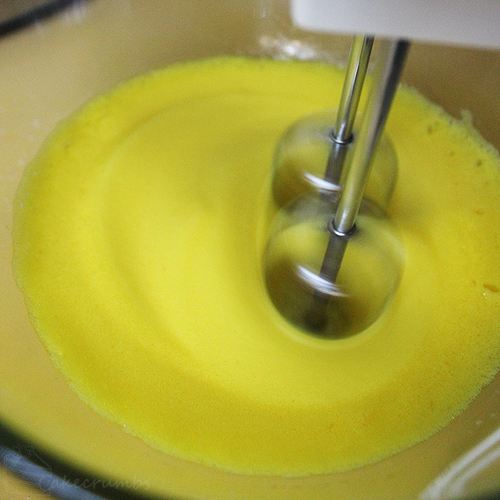 But as you continue the mixture gets thinner and will start to run down the sides of the bowl. When you notice this begin to happen, you can test your batter. You can either dollop a little on a plate, or just drop some mixture back into your bowl. The peak should disappear between 10-20 seconds. If it doesn’t, keep swiping and testing until it does. As soon as it’s deflated enough, stop and put it in a piping bag. When it’s at this consistency the macarons will pipe smoothly and the peaks will disappear into itself, but it won’t run all over the place. To make the stripes on the bees I created a little template of 1/4 inch stripes from a spare piece of acetate I had. I waited until the macarons had dried and formed a skin over the top, then sprinkled some dutch processed cocoa into it. This process is fiddly and it is messy. 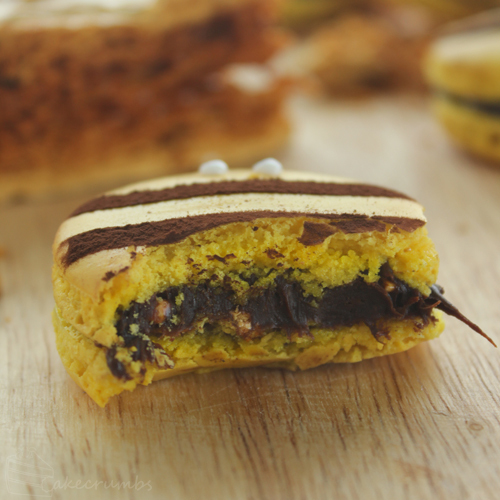 If you’re after a quicker solution, you can always pipe some dark chocolate or use edible ink to create the stripes on the macs after they’ve baked. While the macs are doing their thing, you can get started on the filling. I couldn’t make MacBees without making honeycomb. Home made honeycomb is quick, simple and easy. And, like most things made at home, it’s just so much more rewarding in taste. All it involves is boiling a sugar and honey syrup, adding some bicarb and voila! It takes about 20 minutes to cool and it’s imperative you don’t disturb it during this time. Give it plenty of time to do it’s thing, then try not to eat it all before it ends up in your macs. I had high hopes of having beautiful little rounds of honeycomb in the middle of the macarons, but cutting it to size was just not going to happen. Honeycomb snaps and breaks every which way it wants to, so I decided to find another way to use it. I took about half of it, crushed it up and added it to my ganache. If you want the honeycomb pieces to stay firm and crunchy, you’ll need to coat them in chocolate or fat first. But I wanted to let the honeycomb flavour go through the ganache and see what happened. When the macs are baked and cooled, you can add little features to them. I used a little stiff peak royal icing and piped eyes, then use black food colouring to dot on the pupils. If you don’t want to whip up or buy a batch of icing for the purpose, you can use small round pearls or candies, or just melt a little white chocolate for the job. Soon enough you’ll have your own little hive of honey bees. 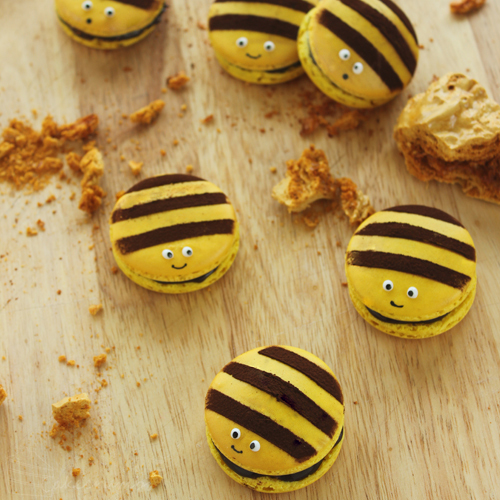 Don’t be put off by their little smiles, they’re totally delicious and are begging to be consumed. I was completely making things up as I went with these, so I’m thrilled by the result. But I’m especially thrilled by the ganache. The honeycomb gives such an incredible dynamic to it. It lends it’s own sweet and bitter flavour to the ganache while making it chewy but filled with specks of crunchy honeycomb. It complements the crunchy and chewy texture of the macaron really well and is definitely my most favourite macaron yet. Here’s how to bake your hive of macs. Prepare baking trays with double sheets of baking paper. Trace 2.5-3cm circles onto one of the sheets of baking paper as a guide for piping your macarons, leaving a few cm between each; make sure the side with the ink/lead is facing down so it does not come into contact with your food. Alternatively, use a silicone or macaron mat. Sift almond meal and icing sugar together; sift mixture twice more, then set aside. 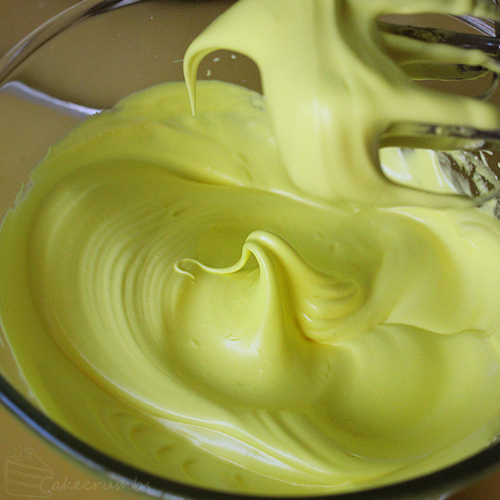 Beat the egg whites until foamy; add enough gel paste or powdered food colouring here to make the egg whites really vibrant. Continue beating on low speed, adding caster sugar a tablespoon at a time. Increase to high speed and beat until mixture forms stiff peaks and is glossy. You should be able to hold the mixture above your head without it falling. 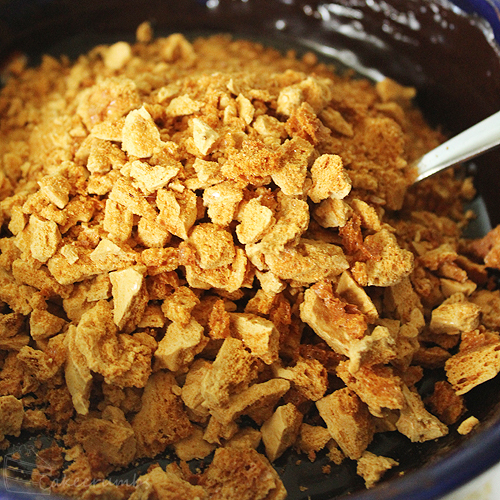 Fold in half of the almond meal mixture until combined, add the second half and repeat. Using your spoon or spatula, swipe the mixture against the side of the bowl, scoop the batter from the bottom and plop it upside down. This movement deflates the meringue. 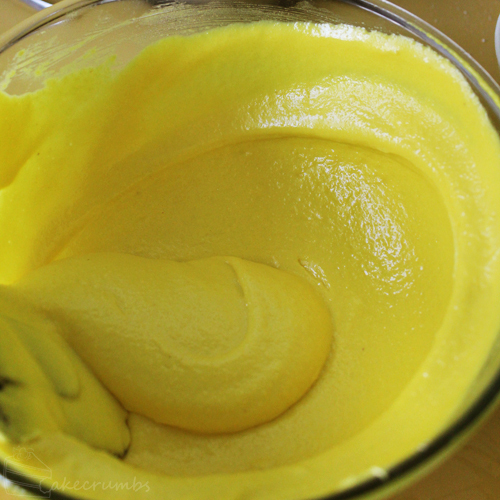 You need to repeat this process until your batter is sufficiently runny. To test, look for the following signs: Your batter will slowly slide back down the sides. 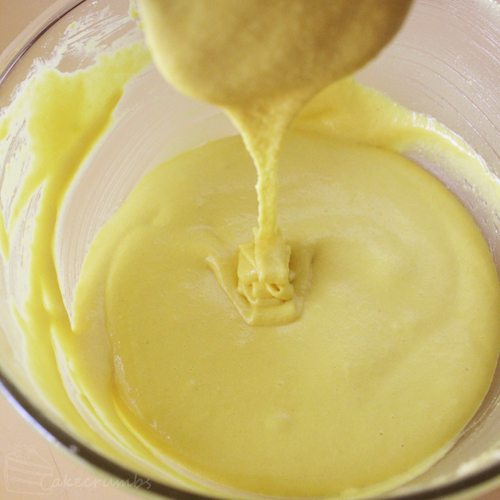 If you scoop up a bit of batter with your spatula or spoon and let it drop back into the bowl, it will fall slowly, form a small mound on top of the rest of the batter slowly sink back into it. Another good way to test is by getting a tea spoon of batter and plopping it into a small plate. If the peak formed when it falls from the spoon sinks back into the batter within 15 seconds, it is done. Fill a piping bag with a 1cm round nozzle, and pipe rounds of macaron batter onto your baking trays. 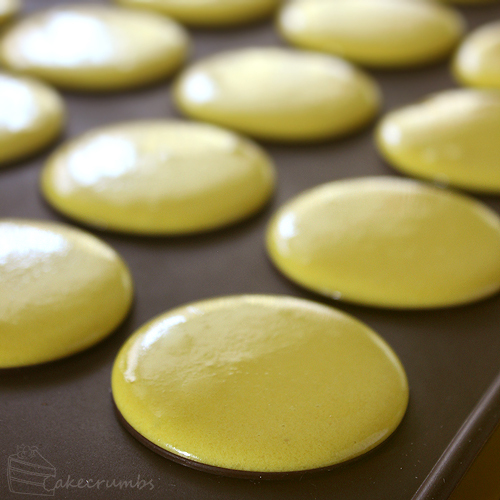 Once done, bang your trays against the counter to knock any air out of the batter. Set aside your macarons aside to dry at room temperature. This will take 45mins-1 hour. Macarons are sufficiently dried when the batter does not stick to your finger when touched. 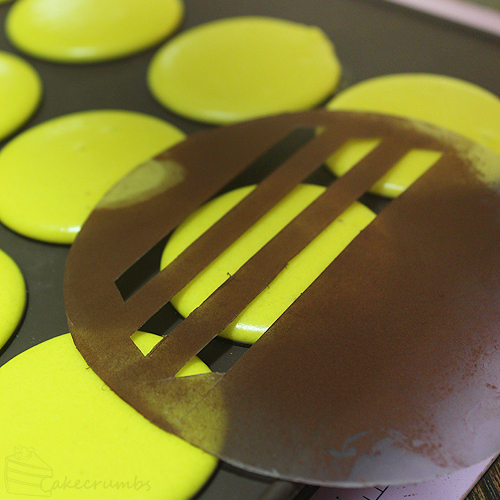 Once dried, use a template to dust stripes of cocoa powder onto your half of your macarons. Preheat oven to 200°C or 230°C fan-forced. Place tray in the oven, reduce temperature to 140°C or 130°C fan-forced. Bake for 20-25 minutes. Here is where you need to experiment, as every oven is different and it will make a difference for macarons. Keep an eye on them and make sure your shells don’t char. Shells will be ready when they can be lifted from the baking paper without sticking. 25 minutes did it for me. Note, if using a macaron mat, the biscuits bake batter at a slightly lower temperature. Try decreasing the temperature by about 10°C and baking for 5-10 minutes longer. 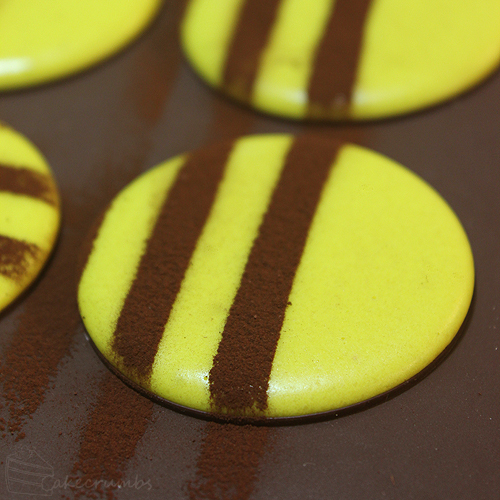 Once cool, pipe on little white dots for eyes onto the macaron shells with the stripes. Use black food colouring or an edible ink pen to dot the eyes and draw on the mouths. 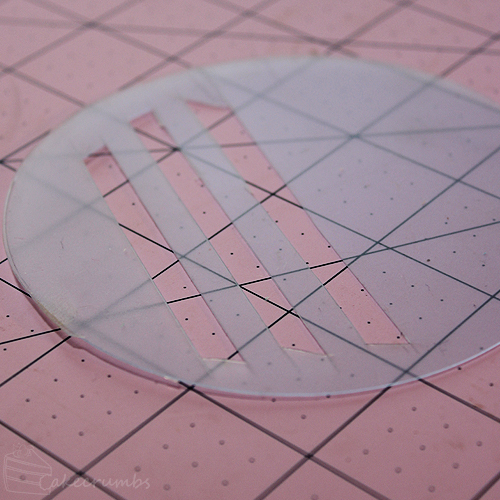 Line a tray with a silicone mat or baking paper. 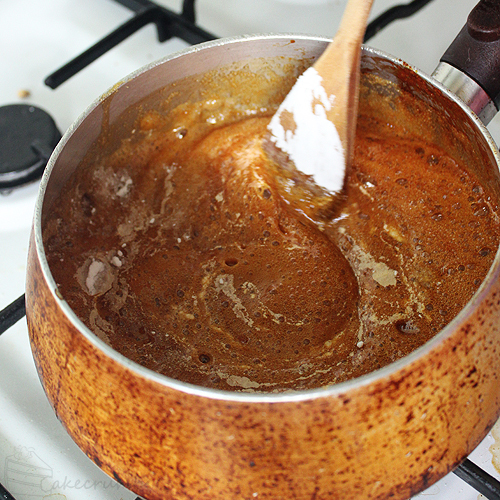 Combine the sugar, honey and golden syrup in a medium, heavy-based saucepan. Stir over low heat until sugar dissolves. 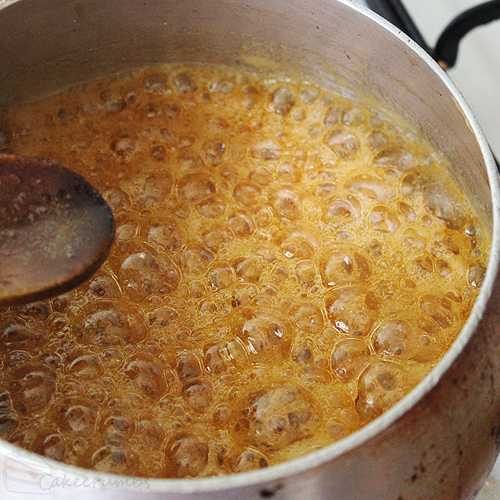 Simmer over medium-to-low hear until mixture reaches crack stage (about 155°C on a candy thermometer) or until a deep caramel colour. Be careful to not let it burn. Remove from the heat; dump in all the bicarb soda into the pot and stir quickly to combine. Pour mixture out onto the prepared tray and leave the bubble and cool (about 20 minutes). Once completely cool, crush with a rolling pit or chop up with a knife. Set aside the chocolate in a bowl. In a small saucepan, bring the cream to the boil. 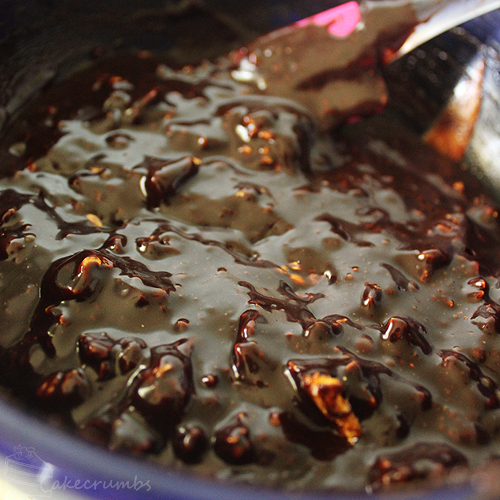 Pour cream over chocolate and stir until chocolate is melted and mixture is combined. Allow to cool to room temperature, then fold in the honeycomb. To assemble, spoon (or pipe with a large nozzle) the honeycomb ganache onto the macaron halves without the stripes. Sandwich with the striped halves. Macs are best after a day in the fridge but can be eaten immediately. Thank you! I certainly have lots to learn about the fragile mac, but I’m getting there! I’m totally confusing – I used half of the amount I made, but by the time I got down to writing the recipe I figured I should just halve my recipe rather than giving the full one and leaving people with half a batch extra. Especially because it doesn’t keep very well so it either needs to be coated in chocolate or something or used up within a day or so. So the recipe provided is enough for the ganache, but feel free to double it if you want extra! Those are just TOO CUTE!!!! My father in law just fixed my stand mixer and I need to make some of those for my kids. Must! Oh wonderful. I might have to pop over and borrow your stand mixer! Morning tea at my place, please! 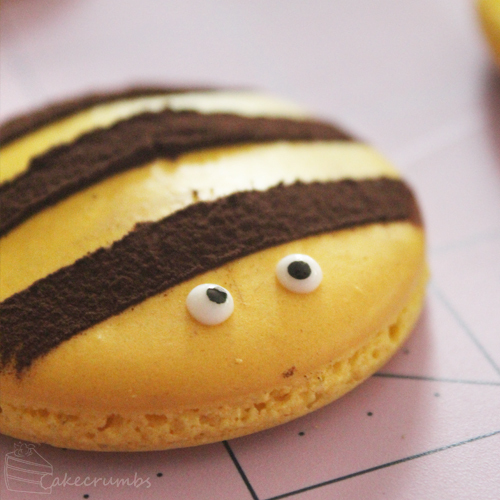 These bee macarons look really cute! 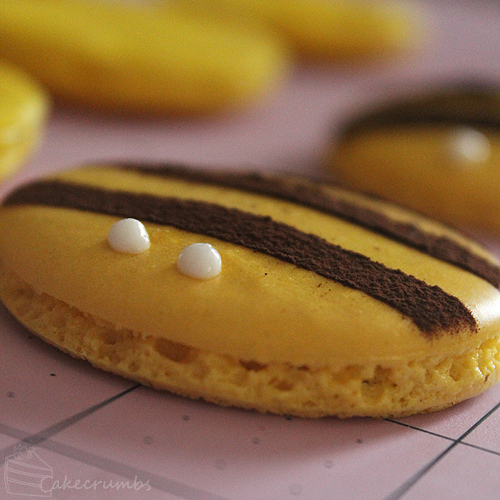 Have been some time I tried baking macarons… I think I should try baking some soon! So I’ve had issues with macaroons before but I tried this recipe and they turned out amazingly! So tasty I’m sure they won’t be lasting long, thank you! Yay! I’m so glad you were able to reach macaron success! These are one of my favourite macacrons you’ve made so far, flavour-wise. Very inventive and they looked great. Squee! 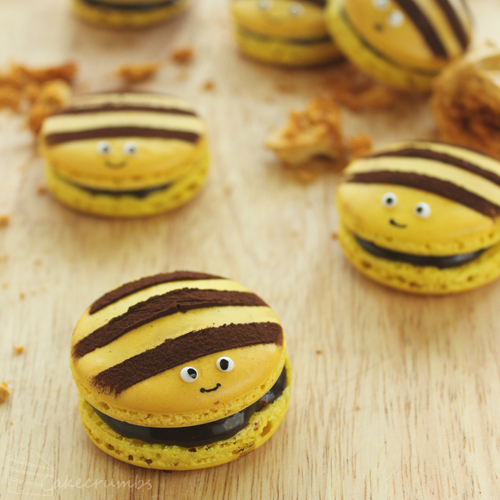 Their little faces are just gorgeous, and I love the idea of a honeycomb ganache. Just gorgeous! 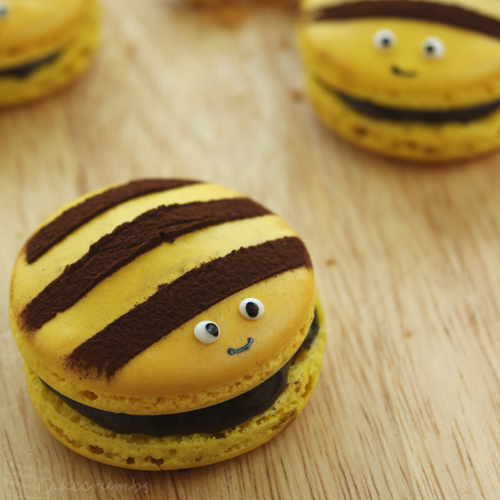 they are so cute, and sound delicious, I have been wanting to try making macarons now I definitely have to. Pingback: cakecrumbs.me/…… – Your Family Will LOVE These Cakes!